The Warriors led by nine points at halftime and turned it up from there en route to an 80-41 victory. Caledonia doesn’t just force turnovers on the gridiron. The school with the Class 2A state football champions is just as quick to pounce on the ball when it’s loose on the basketball court. 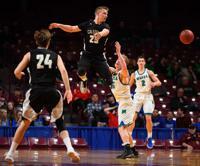 The Warriors used an aggressive, opportunistic defense to force 28 turnovers in their 80-41 victory over Minnewaska Area Wednesday in the Class 2A state basketball tournament at Williams Arena. While the Warriors (27-4) are making their fourth state appearance in five years, it’s the first tournament as head coach for King. After serving as an assistant the last five years, he is relishing the chance to coach all three of his sons – senior Owen, sophomore Noah and eighth-grader Eli King. The trio of guards combined for 30 points and 13 of the team’s 22 steals. Senior Marten Morem led the Warriors with 18 points. Click to watch the live stream of this game at Prep Spotlight TV.